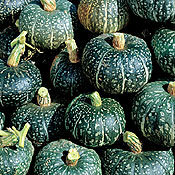 description for "Winter Squash and Pumpkins: Cucurbita maxima, 'Libra'"
Cucurbita maxima 'Libra' is a cross between Hokkaido and Buttercup. This vigorous mix of 2 different color and seed types bears fruit with consistent size and shape. 85% have dark-green skin with white markings, while the other 15% are slate gray-green. 'Libra' has superb eating quality. reviews for "Winter Squash and Pumpkins: Cucurbita maxima, 'Libra'"